Wyoming is a a state in the mid-western United States. 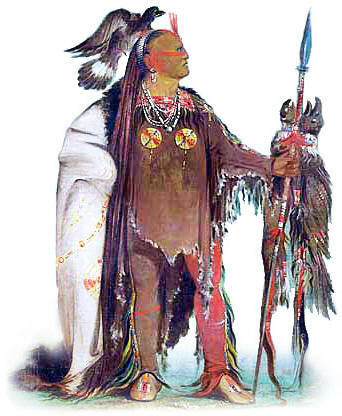 There are many famous Native American tribes who played a part in the history of the state and whose tribal territories and homelands are located in the present day state of Wyoming. The names of the Wyoming tribes included the Arapaho, Bannock, Cheyenne, Comanche, Crow, Dakota, Kiowa, Pawnee, Shoshone and the Ute. The climate, land, history, environment and natural resources that were available to the indigenous Indian tribes in Wyoming resulted in the adoption of the Great Plains Indians culture. Meaning of State name: Named after a Dakota word meaning "large plains." 1876: Great Sioux War, aka the Black Hills War, (1876�1877). Battle of the Rosebud in Montana. Lakota Sioux and Cheyenne under Crazy Horse turned back soldiers commanded by General George Crook cutting off reinforcements intended to aid Custer at the Battle of Little Bighorn. The history of the European invasion brought epidemic diseases such as tuberculosis, cholera, influenza, measles and smallpox. The Native Indians of Wyoming had not developed immunities against these diseases resulting in huge losses in population. Exploitation including the leverage of taxes, enforced labor and enslavement were part of their history, taking their toll on the Wyoming Indians.